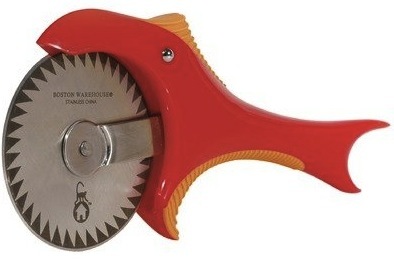 Piranha Pizza Cutter « Gluttoner: You gonna eat that? Cutting pizza isn’t easy, you need something with razor sharp teeth like a killer fish. The Piranha Pizza Cutter measures about 8 inches long, has a stainless steel cutting blade, a high density plastic handle with soft textured grip and it will eat you alive if you go in the water. Puts the “fun” in functional.